This week the NASCAR haulers are making one final trip to the heartland of the US, the Kansas Speedway. This week is an elimination race and four more drivers will have their dreams destroyed when the checkered flag flies in the Hollywood Casino 400. 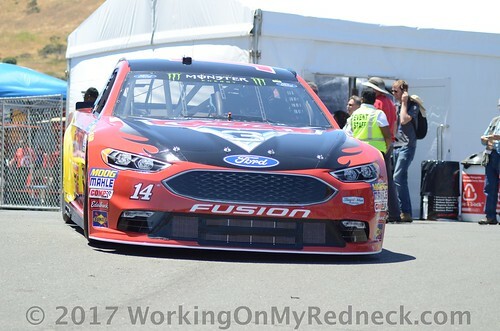 As you can tell by the accompanying photo, the Kansas farm boy, Clint Bowyer, is the apple of many of the eyes in The Redneck Fantasy League this week. Is it because he ran really strong last week at Talladega, or is it because he grew up about 110 miles from the Kansas Speedway? Well, who knows for sure? Notwithstanding those two questions, he has slightly more than one-fourth of the players on his side this Sunday. The six players that are all in with Bowyer include Bobby Blue Crush, Linda R. The Lemonade Lefty, Jerry The Buschwacker, Linda B. The Cookie Mom, Ol Skid-Marc, as well as Dan The Numbers Cruncher. Next, we have three drivers who have hijacked a pair of players each to play the part of their cheering section for the upcoming race at Kansas. Snoopy Dawn is teaming up with Leon Your Most Humble Sheriff and they are putting their all into rooting for Kyle Busch at Kansas. However, Jim, aka Chiefy and Jeremy The Coach see things vastly different this week. Both are hanging with the young second-generation driver from Dawsonville, GA, Awesome Bill’s kid, Chase Elliott. Lastly, Karen The Highly Opinionated Southern Belle and Carlton The Doorman are betting the farm that “The Delivernator”, Denny Hamlin, can lead the field to the checkered flag, drive his hot rod to Victory Lane, and hoist the hardware. As I mentioned in the opening paragraph, this is an elimination race where names are made and dreams are broken–all in the same event!